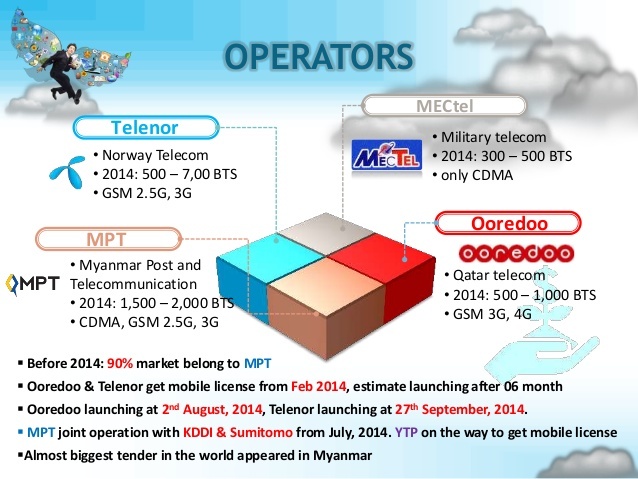 There are currently 3 tele operators in Myanmar. MPT is the oldest and more expensive than the rest. However it also provides the best coverage and other functions such as data roaming. Telenor and Ooredoo are very new operators and hence they have limited area coverage. So in this blog post, we will share the important information about MPT service mainly. You can check and buy at most of the numerous mobile phone shops throughout the country. The official cost for a SIM card is 15000 Kyats however, the price may be varied. Possible cost is around $5 or $7 USD. Any unlocked phone, good or old is fine. All 3 operators can provide 3G. Slow most of the time. Cannot guarantee. Roaming charges – USD $1 per minute. Above are not all the countries available. You can check more information about roaming here.